The first thing you might notice when you look at this map of Dominica is that there are very few beaches and they are far from the cruise pier. Click to enlarge the map and then click again on the little camera icons to view some virtual Dominica tours. I remember when I first saw Dominica island from afar, standing on the deck of a cruise ship, a long time ago. It looked so small and very green. No wonder, it's only 29 miles long and 16 miles wide, with a population of 71,000. It is located between the islands of Guadeloupe to the north and Martinique to the south. Dominica is home to the only existing Carib Indians who are the indigenous people of the Caribbean islands. If I want to describe this island in a nutshell, it would be: volcanic mountains, rainforests, lots of water, even a boiling volcanic lake. And for just those reasons, it was chosen as a location for both Pirates of the Caribbean 2 and 3 movies. Look on the map of Dominica again, at the top, Hampstead Beach? Well that's where Orlando Bloom and Johnny Depp started their sword fight that finished at the ruined church. This tiny island has 365 rivers with hundreds of beautiful waterfalls and is nicknamed the Nature Island, for obvious reasons. This is the Mother Fall (I guess because it's not as high as the Father fall!) and is part of the Trafalgar Falls that are between 180 and 200 feet high that converge in rocky pools. As far as the climate goes, temperatures range from 78° - 89°F. One thing is for sure, there are only 2 seasons in Dominica, dry (January - June) and rainy (July - December)!! Dominica has become known as the "Whale Watching Capital of the Caribbean" because of the high rate of success in seeing whales or dolphins during whale watching excursions here. However, your chances are higher during the winter months from the end of November to March. Guess the next time we stop at this island, I'm booking us a whale watching tour! 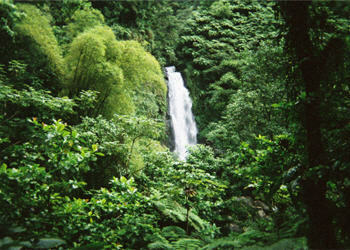 When you travel to Dominica, make sure to go on a tour. It's a small port and there isn't much to do or see right at the pier. And I would definitely recommend Levi, our tour guide from the last 3 times we were there. He is wonderful and you can ask him to take you to different spots mentioned on the map of Dominica, if there is time. He's the one who took us snorkeling in Dominica in November 2008. And that was a very pleasant surprise. You should try it.